(park east of the high school; directions are posted on the website www.starkids.org). The guest speaker is Bob Arentz from Ball Aerospace & Technologies Corp and the title of his talk will be “Searching for Near-Earth Objects (NEOs)”. The inner solar system is home to the planet we care about the most, and also to something like a million other things called Near-Earth Objects, or NEOs. NEOs are fragments of asteroids that are produced by either close gravitational encounters, or from direct hard-body impacts, of Main Belt Asteroids. Following an interaction, objects are then scattered into the part of the Solar System where the Earth resides. By definition, any object that comes within a tenth of an Astronomical Unit (AU) (approximately nine million miles) of the Earth’s orbit is called a Near-Earth Object. As such, NEOs are a complex and dynamic population, ranging in size from a few very big objects down to perhaps a million, or so, smaller objects as big as a large skyscraper. And while infrequent, NEOs do hit the Earth, resulting in a complex array of effects. Arentz will present an overview of NEOs, and then explain what happens when they hit the ground. He will then present a very high-level overview of a system designed to locate 90% of the remaining unknown NEO population and will close with a very brief look at the types of things that could be done to mitigate an impact threat before any in-bound NEO could strike Earth. The observatory doors will open at 7:00pm and the talk will start at 7:30pm. 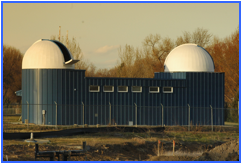 Weather permitting, after the presentation visitors will be invited to look at various celestial objects through the large telescope. Public star nights are held the third Friday of each month (except July, when the LTO is closed for annual maintenance). No reservations are necessary for these nights. Just come and join in for the talk and some observing afterwards.